Regions of Ruin has been described as Kingdom with RPG elements by some reviewers. I’ve seen the game, but I’ve never actually played Kingdom so I can’t give you a comparison. Well… it’s 2D and pixelated. I guess I can give you two similarities. 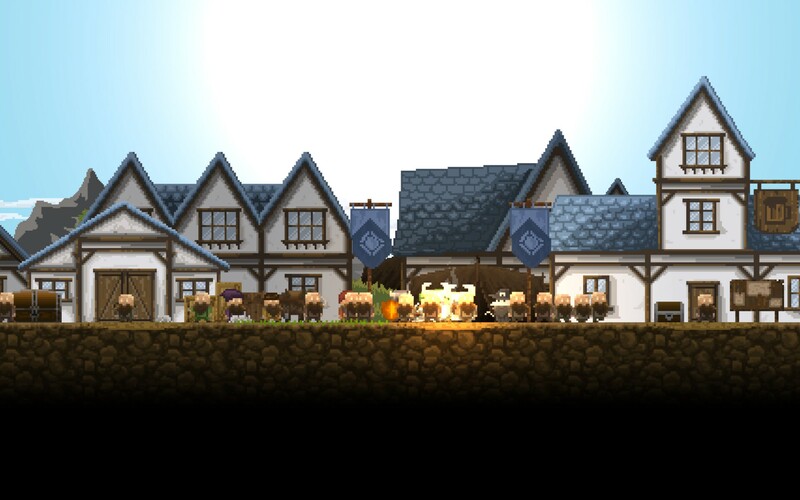 As far as Regions of Ruins goes, does being a Dwarf sound cool to you? How about beating up a bunch of orcs and goblins by the hundreds (in total, not all at once)? There’s also some city building and sending out helpers to gather resources. Is it any fun though? Let me break it down for you. 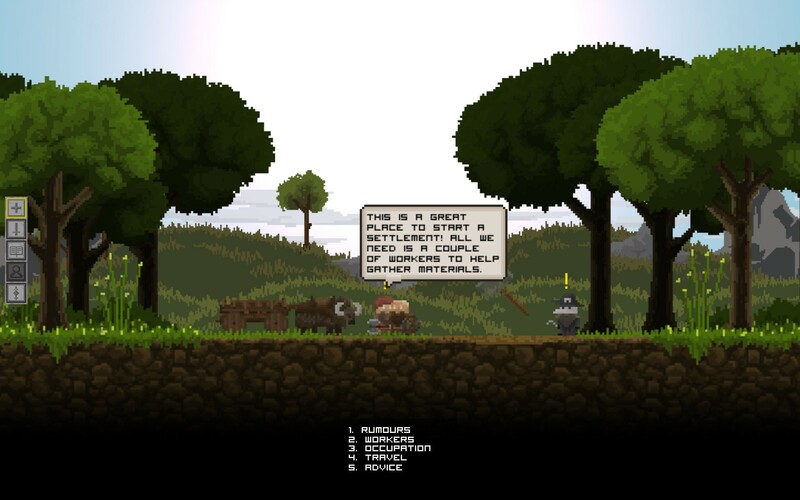 As a Dwarf, you start out looking to cleanse the land of some orcs. Why is the land in need of cleansing? Well, tired of the outside world after a bitter war, the Dwarves holed themselves up in their mountain homes and after a long time decided to come out and found no more humans or centaurs or bustling cities, but a land plagued with orcs, goblins and liches. Lots of bad. Then they also get driven from their homes and are now scattered throughout the land. This is where we start. The Dwarves need to build up a kingdom and army to take back what was taken from them. The whole game is a journey to build up and find a way back to your ancestral greatness. Biting off more than I can chew is a bit painful. You’re given an odd set of controls that feel very funky at the start, but slowly work themselves into your subconscious… mostly. It’s almost like an old-school shooter using WASD and the arrow keys to move and attack respectively (in how odd that is to me because I hated those controls). There are other keys to interact with your menus, maps and inventory, but that all makes sense. As I said, it’s odd, but I’m getting better at it, but the movement in the game itself comes off as simple and unflashy. On the other hand, that might be because I was playing the game incorrectly at first. You’ll need to skill up into a hack’n’slash game control scheme (if that’s even possible). 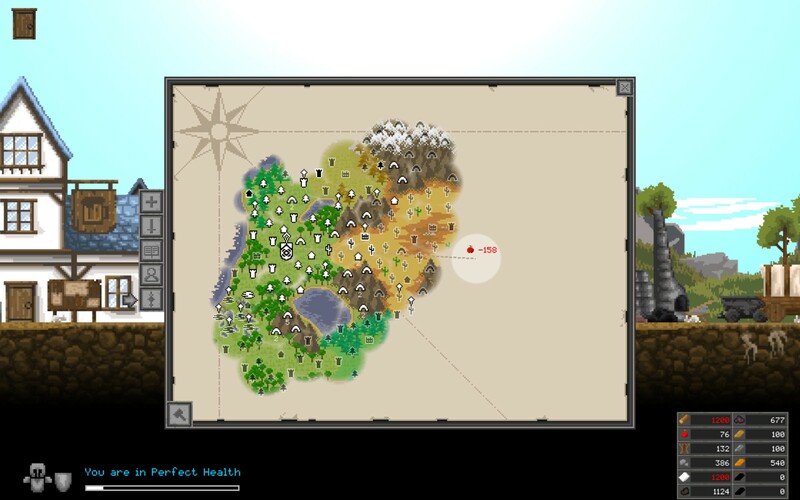 Regions of Ruin is more of a tactical platformer where you need to make good decisions with your movements and actions. You will need to use your shield and move in with a dash to close distances at times. You can be offed by a bunch of baddies if you’re not careful, so rushing into battle (kind of like Dwarves are known for) will probably get you killed at the start of the game. You can also sneak around as well and this is really coolly done with the use of layers. When you’re not going stealth (which isn’t a truly viable option for the whole game I’ve found) you run around in front of everything and you’ll probably not think anything of it. When you go stealth you’ll start bobbing back and forth through trees and structures. It’s very nicely implemented and doesn’t just have you fade to mostly translucent like they could have done. From here you can get closer before the baddies see you or attack with throwing axes from afar. If I’m going to be completely honest, throwing axes does feel a bit… cheap, but it is a solid chunk of the way I play. There are definitely areas that require you to be a bit more beefed up in gear even though Regions of Ruin will throw large numbers of massively strong guys at you at times. It almost seems to negate all my cool gear. Sometimes you get an opportunity to snipe a whole camp out with some well placed axes. Well… a LOT of well placed axes. So why not take the safe road. It would behoove you to turn on “Throw Aiming” on in the options as it helps immensely with the chucking of axes. Lore and shiny new toys, I mean loot, that’s why you go everywhere and kill all of the baddies! 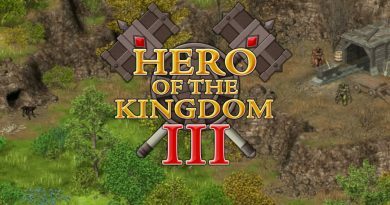 Since you don’t have a kingdom yet, you’ll also need to build one as a base to go out on these raids of baddie killing. Your camp starts with a simple fire and you’ll build from there. You’ll build forges and libraries and apothecary tents. Everything a Dwarven starter kingdom would need. Of course the first thing I built was a tavern. Little did I know that there was a lot more too it than simply building these… buildings (for the lack of a better word). Each building starts out as something simple, but you can upgrade them and their usefulness increases (even if it’s incremental). You’ll be able to smelt different ores, trade for better products (even though that one feels like “on disc DLC”, just let me buy some stupid rocks! ), and hire more adventurers at the Tavern. You’ll also gain access to quests that will range from “Simple enough.” to “What the hell!?!? That was a one star quest!” The usual. Either way, upgrade your town. I learned this late in my game and I really wish I would have paid more attention. I still can’t enchant weapons yet, but I’m working on it. I’ve inadvertently started the clone wars. I still need more though! I could have done this solo since those evil nasties can’t climb ladders, but one of my more eager Dwarves decided to jump down into the fray. He lived even though I was chucking axes into the fight. Thank goodness for no friendly fire! 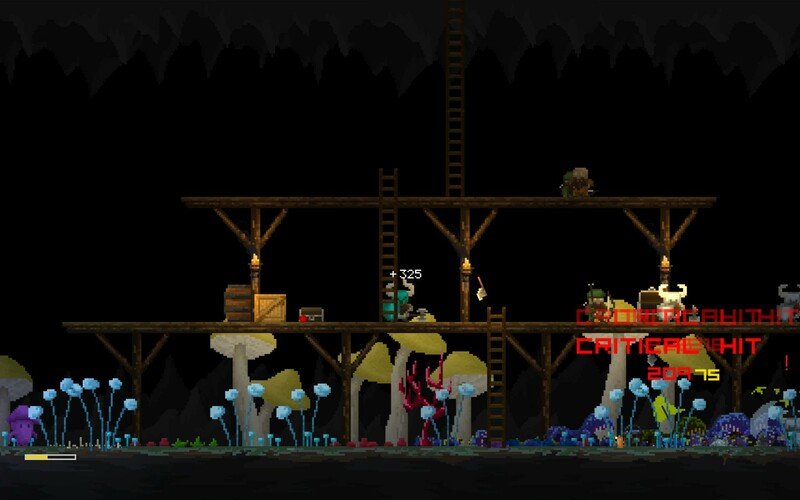 From an indie game that came off as “neat” because it has Dwarves in it, Regions of Ruin has risen through the ranks as awesome! The more I play, the more I discover how deep the game is and how much fun it can be. Yes, there are some difficult parts to the game, but so far it seems like they are able to be overcome with time, better planning, gear and manpower. Building up your base is tedious, but worth it and the work it takes does makes sense. I just got into that part of the game late so I was able to do a lot at first so It feels like I hit a wall, but I simply caught up with myself. 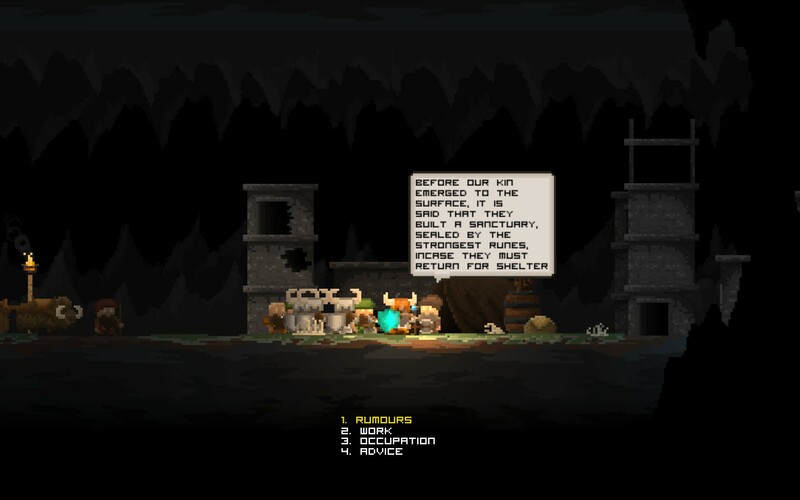 The combat is better than it appeared when I started Regions of Ruin and just goes along with the theme of “the more I played, the better it got”. 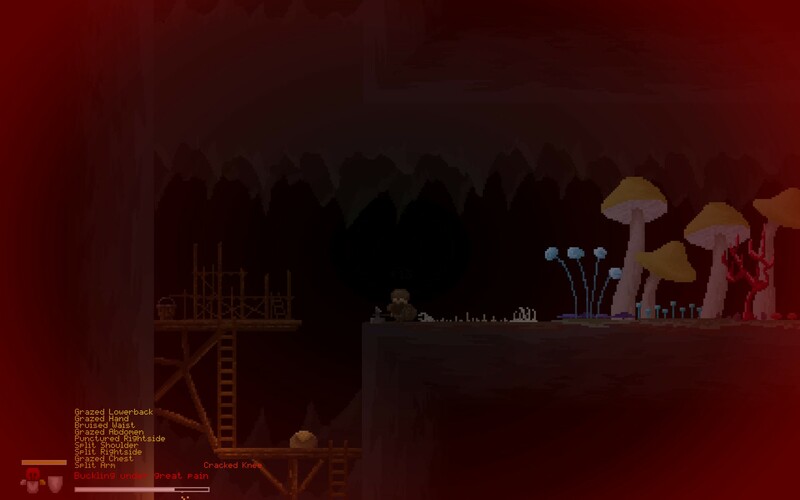 It has platforming in it, but I would more call Regions of Ruin a massive 2D RPG with fast-travel. Regions of Ruin is a blast to play. Now if you’ll excuse me, I need to get back to my army of Dwarves.